We all want to look younger. Wouldn’t it be great if we could turn back the clock? 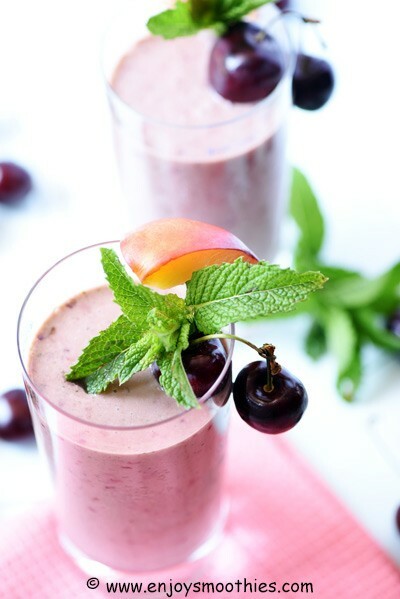 While it’s not possible to waive a magic wand and watch the years miraculously melt away, drinking anti-aging smoothies will help fight cellular damage and keep your skin looking younger. What causes the skin to age, with its resultant sagging, wrinkling and lack of youthful volume? Free radicals are molecules that react with and cause damage to other molecules. They are formed both internally and externally. In the body they are a by-product of metabolism whenever oxygen is involved. Oxidation occurs when free radicals break down a cell’s components such as its proteins, DNA and membranes. Externally, they are caused by stress, lack of sleep, fried foods, alcohol, air pollution, sun exposure (UV rays), X-rays, cigarette smoking and pesticides. When the free radicals outnumber the antioxidants they damage the body’s cells which lose their ability to function properly. Antioxidants have the ability to counteract the effects of free radicals. Your body can produce some antioxidants, but that ability declines as you age. So it’s important to pack your diet with antioxidant-rich foods. Everything you eat and drink contributes to the way you look. Remember, what you put into your body, shows on the outside. Combined with a healthy diet should be a healthy lifestyle. In fact the two really do go together. Harmful environment and lifestyle choices can cause premature aging. While we cannot change the natural aging process, by taking preventive action we can slow the effects of aging on our skin. 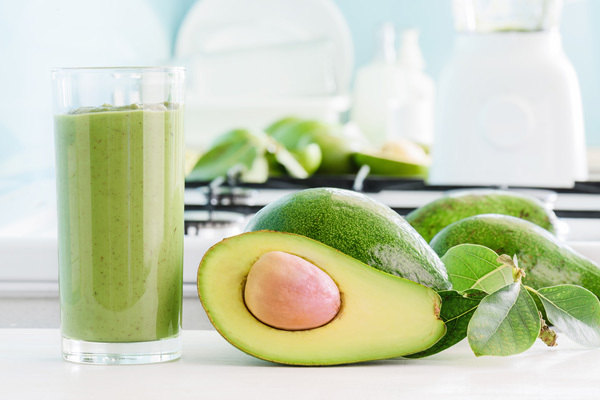 Filling your blender with a colorful array of fruit and vegetables and chugging down these anti-aging smoothies will give your body a serious boost in fighting cellular damage. Grapes, carrots, leafy greens, herbs such as rosemary, thyme and oregano, green tea, citrus fruits, low-fat dairy products and berries keep your skin looking younger. Foods high in zinc and selenium, found in nuts, seeds and whole grains improve your skin’s circulation. Healthy fats, such as those found in avocados, flax, hemp and chia seeds plump up the skin. Cucumbers and watermelon have a high water content and keep your skin hydrated. Pomegranates boost collagen production, helping to keep your skin firm. Turmeric repairs sun-damaged skin and prevents wrinkles. 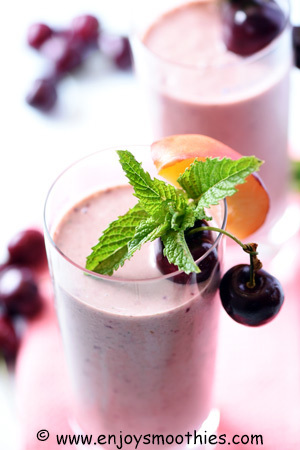 Add the frozen cherries, baby spinach, nectarine, coconut milk and coconut yogurt to a blender. Blend until the desired consistency is reached then pour into a glass. 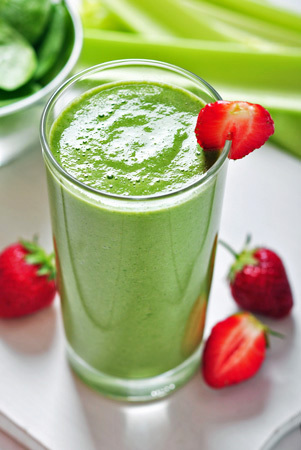 In a blender place the baby spinach, banana, orange segments, strawberries and green tea. Blend until you get the desired consistency. 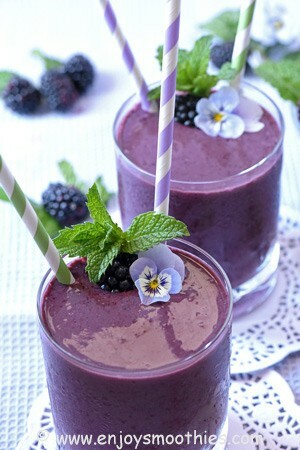 Blitz together the blackberries, lettuce, yogurt, honey and milk until velvety smooth and creamy. Pour into two serving glasses and enjoy.